Enriching our Community. Expanding our World. 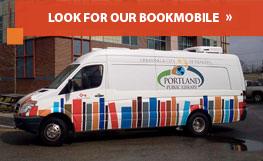 Portland Public Library (PPL) is the city’s cultural center, serving 675,000 visitors annually at four locations and a bookmobile. 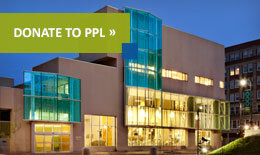 Chartered in 1867, PPL is Maine’s oldest and largest public library system and is the most visited cultural institution in Maine. 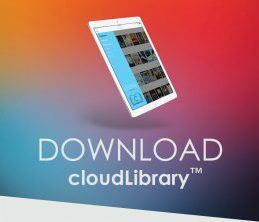 The library offers over 300,000 books, audiobooks, musical recordings, movies, and digital resources, and access to the collections of the world’s great libraries. We also provide robust internet access and free wireless connectivity. We present a wide variety of lectures, classes, exhibits, programs and performances for all ages. The library is a 501(c)3 institution with a staff of 53 FTE and is governed by a Board of Trustees. Portland Public Library will be the civic and cultural center of a dynamic region in which citizens are literate, informed, and engaged. The Library will provide resources and experiences that inspire imagination, curiosity, awareness, and learning. The Library will embrace change and evolve to meet the needs of the community.